Half baths or “powder rooms” are places in our homes where we can be creative. 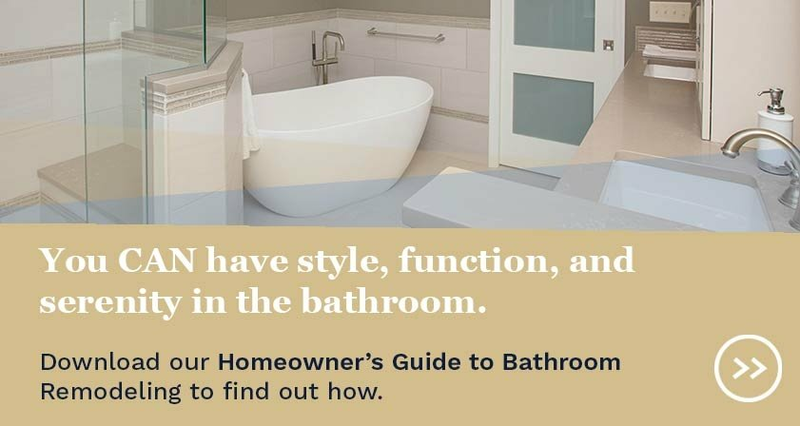 We often refer to half baths as jewel boxes of a home because these are small spaces where home homeowners may add high end products without incurring huge costs. Since a half bath is often located off the central area of a home, it is also a great space to add a splash of color or to display artwork. If you are planning to update or add a half bath to your home, the basic elements are a toilet, sink and mirror. Shelving and cabinets can be added as space permits. Consider walls, floors, ceilings, windows and especially the door in your plan. Note the swing of the door. Does it open into the room or to the adjacent hallway? Is the door a pocket door? The door placement and style will define the space and options for accessories such as shelving, towel bars, hooks and artwork. 1. 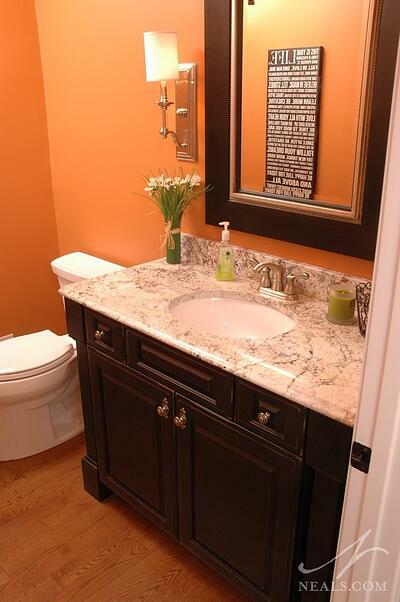 A vanity is often the focal point in a half bath. Consider elegant custom cabinetry tailored to fit and optimize the space. Furniture-style vanities work well in small spaces. They may feature small drawers for storage or open shelves below to keep towels, bath tissue and soaps at hand. Furniture-style vanities come in a range of sizes, finishes and styles. For a unique vanity, select a table or console and add a sink to the piece. 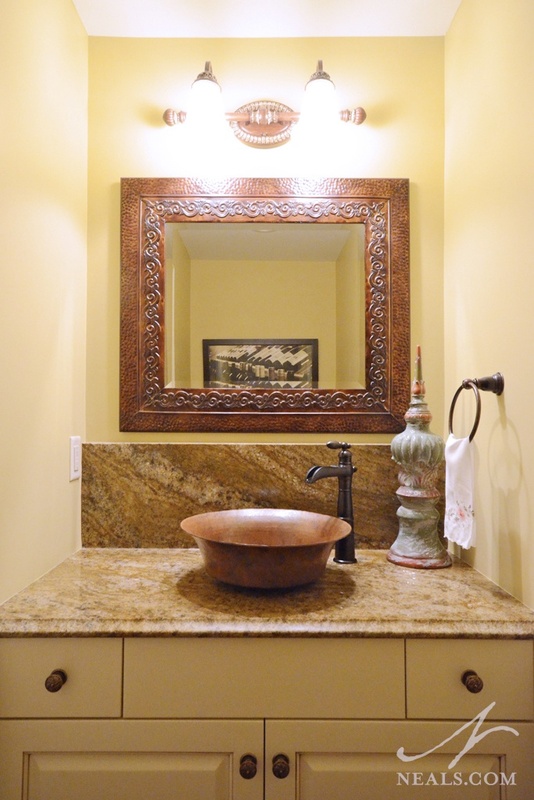 You can use high-end granite, marble, quartz or tempered glass for a vanity counter. 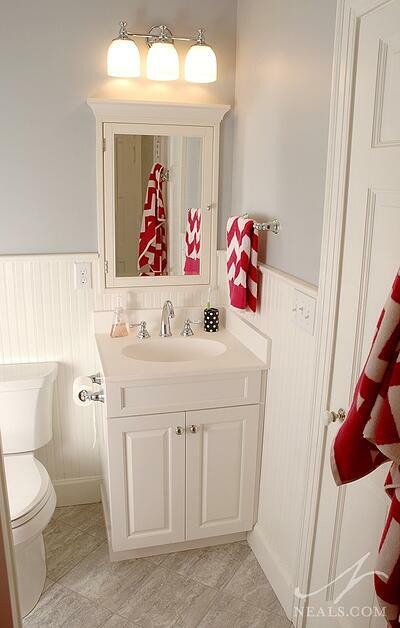 If space in the room is tight, a pedestal sink may be a good option. Look for a sink that is wide enough on the surface to accommodate a soap dish and possibly a towel bar. 2. A half bath is a perfect spot for an interesting or elegant sink. Vessel sinks come in a variety of styles, materials and finishes and fit well in small spaces. Pedestal sinks are space savers and can add architectural interest to the room. While the classic white sink remains popular, pedestal sinks are available in a variety of styles, forms, colors and materials. Some are created by adding a vessel sink to a pedestal. 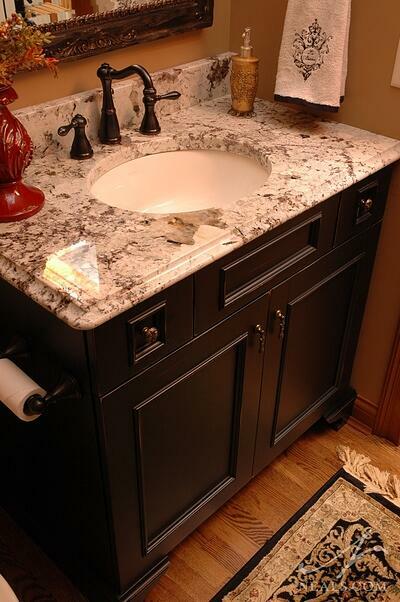 Also, consider under-mount sinks, especially if you select a stone countertop for a vanity. 3. Small details count, spend some time selecting a faucet. New faucet designs are amazing and can add interest to a half bath. There are styles that can be mounted on a sink, vanity or wall. Finishes are important, too. Brushed nickel continues to be popular but look at chrome, brass, oil rubbed bronze or copper. Faucets can be expensive, so consider this as a “splurge” item in your plans. Also, look for towel bar and tissue holder accessories that match the faucet you select. 4. A mirror is an essential feature in a half bath. As a design element, mirrors reflect both images and light to create an illusion of depth that can make a room seem larger than it actually is. Mirrors can be used in several ways, a mirrored wall, in an elegant frame hung over the sink, hung on walls in lieu of artwork or installed strategically with light fixtures. 5. In a small space lighting is important. 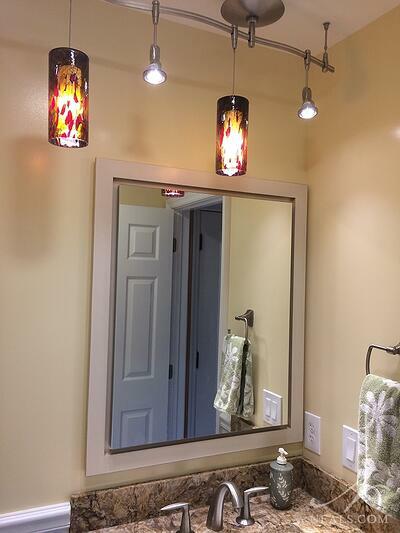 Bathroom lighting is often selected in conjunction with mirrors. Lights can be placed above mirrors, on each side of a mirror or within the mirror. Select fixtures that illuminate the sink and mirror so that people can check their appearance. If your space has a high ceiling you may be able to install a light fixture there. Consider pendant light fixtures. Pendant lights add glamour and sparkle as well as functional lighting to a room. If your bathroom lacks a window, a sun tunnel may be a way to add natural light. 6. Wall tile is an option worth considering in a small bathroom. 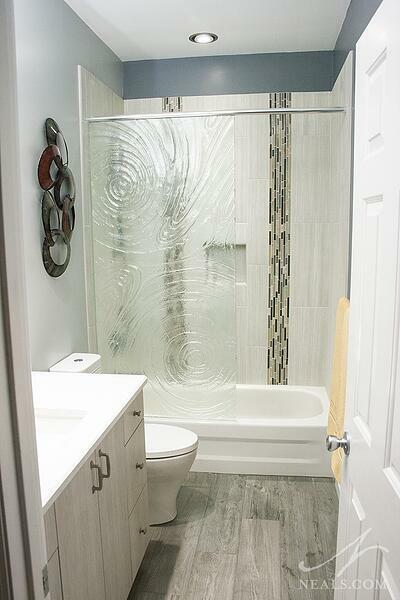 Adding a tile backsplash or shower tile to a small bath can brighten the room or add an artistic element. There are beautiful glass mosaic tiles to choose from as well as ceramic tile, natural stone and marble. Wall tile is often the “wow” factor in any bathroom. 7. There are numerous options for flooring in a half bath. Condensation is generally not a problem in a half bath so you can install carpet or hardwood floors. More homeowners are opting for hardwoods to create a uniform threshold from the hall into the bathroom. Hardwoods can be laid in patterns, with a border or can contrast with the hall flooring. The most popular bathroom flooring is still tile. Ceramic floor tile comes in many sizes and colors and works well in small spaces. White and black mosaic tile continues to be a classic flooring choice for half baths. 8. 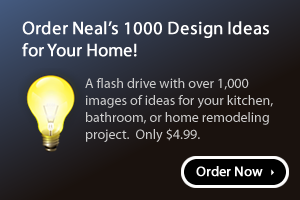 Add color to your home with paint or wallpaper. A half bath is ideal for adding rich color to your home without being overwhelmed by it. Jewel tone colors like rich reds, gold, turquoise, russet or plum add warmth. For drama try black, dark brown or deep grey. Intense yellows, blues and greens with white accent trim will brighten the room. White, neutral or pastel colors can a make the room seem larger. Textured wallpaper can create an aura of elegance. According to Ron Klei, President of Ron Klei & Sons, Inc. Paint and Wallcovering, "Today's wallpapers come in a huge variety of patterns, colors and textures to fit every design mindset, even that of the minimalist." The biggest paper trend? Klei calls out "Grass cloth and strie materials in particular" for their texture and look. Grass cloth creates a natural backdrop that can easily be styled traditional or contemporary, and comes in many colors. Show your personal style in the small space by displaying unique artwork, or by selecting decor details that may not work in other areas of your home. If there's a style you would like to explore more in depth, but that is too intimidating to try in the main areas of your home, the powder room is a great room to try it out.